Sam Hawke’s debut novel, City of Lies, is the first book in The Poison Wars series. Though it’s mostly set in one city, this thick epic fantasy novel becomes increasingly large and sweeping, beginning with mysteries involving sudden deaths and an unexpected siege that lead to deeper discoveries about the past. It’s also an intimate, character-driven story narrated by two siblings who face deeply personal stakes—from their own survival to that of their friends, their family, and their people—while tenaciously pursuing truth and justice. Despite some slow pacing in the middle, I found City of Lies to be one of this year’s standout novels and am looking forward to the release of the sequel, Hollow Empire, next year. On the surface, Silasta appears to be peaceful. Its nobility consider themselves to be quite civilized given their disdain for violence and turmoil. However, it’s not exactly uncommon for them to be hiding murderous intent underneath their polite veneers—and long ago, one family dedicated themselves to discreetly protecting the Chancellor from subtler methods of dealing death, handing down their knowledge from generation to generation. On the surface, Jovan’s uncle appears to be the Chancellor’s dearest friend, just as Jovan appears to be the Chancellor’s heir’s dearest friend. Though these friendships are genuine, Jovan’s uncle is also an expert in poisons who proofs the Chancellor’s food and drink—and Jovan is his apprentice, openly training to follow in his footsteps as an experienced chef while secretly training to follow in his footsteps as the next Chancellor’s poison detector. Jovan and Tain, the Chancellor’s heir, are thrust into their uncles’ roles sooner than expected when both older men suddenly die from an unfamiliar toxin. However, it soon becomes clear that assassination was only the first part of the scheme: an “accident” freed all the messenger birds used to send news outside the city, and the funeral is interrupted by attackers surrounding the city walls. Given that the plot involves betrayal, murder, and war, City of Lies may sound grim, but it’s ultimately an optimistic novel with sincere characters at its heart: as they work together to get to the bottom of the upheaval within their city, they also work to mend divides between their people out of a true desire to listen, learn, and address any grievances. It’s also a wonderful, well-executed book that I enjoyed immensely. Though I did find the pacing to be a bit slow at times, especially around the middle, I found it nearly impossible to put down throughout the tension-fueled last 30%—and that, combined with the fact that I loved the story and the characters, more than made up for a bit of slowness. The challenges the characters confront range from navigating new duties to trying to survive during a tumultuous time, but the plot is largely a mystery with the characters questioning whom they can trust. Stories focusing heavily on investigation do not always appeal to me, but this one worked for me since resolving it mattered to main protagonists I cared about and I thought it was well done. Although readers discover the answers plus more about their people’s past and ancient magics along with the characters, it’s logical that they’re misinformed in this case and it does not feel like an authorial tactic intended to keep readers in the dark. This is partially because they make discoveries related to long-forgotten history, but it’s also realistic that the comfortably wealthy and powerful would be oblivious to the concerns of the common people—not due to malicious intent, but due to being isolated and narrow-sighted. As engaging as I found the story and themes centered on humanity, I thought the highlight was the characters. Both Jovan and Kalina have similarly refined narrative voices befitting nobility, but their perspectives are each their own. Jovan’s point of view largely focuses on poisons (of course!) and his approach to managing his obsessive compulsions. Earlier in the book, I preferred reading his sections largely because of his area of expertise and his close friendship with Tain, a carefree, fun-loving, charismatic person who accepts his new responsibilities with a gravity unexpected by many. Jovan and Tain’s new positions also cause some discord between them, as Tain is troubled by Jovan’s constantly risking his life for him and sometimes disregards his lectures on food intake. It’s also largely through Jovan’s eyes that we see one of my favorite characters later in the book, Hadrea: an undiplomatic, blunt commoner who does not mince words when it comes to what she thinks and feels. Kalina, however, is a more intriguing character than her brother even though it took longer for me to find her chapters as riveting as Jovan’s. As the elder of the two siblings, Kalina was actually supposed to be their uncle’s heir, but health limitations cut her instruction short. Her respiratory problems and tendency to become ill easily made it impossible for her to build an immunity to poisons without risking her life, and she nearly died when beginning her apprenticeship. Since then she’s covertly trained as a spy and observer, and she uses the fact that people often underestimate her to her advantage. Kalina is determined and resourceful with amazing reserves of inner strength, and it was she who stole the show in the end. Though these characters are primarily confined to a single small area throughout the novel, the world seems vast given the rich development of this one place’s culture and (eventually) history. Their main governmental body consists of six inherited positions and six Guild heads appointed by merit, who may or may not be from a noble family. These leaders can be men or women, and their family structure is matrilineal. Though they exist in other parts of the world, marriage and fatherhood are not part of their tradition, and young children are generally raised by their mothers and their mothers’ brothers. 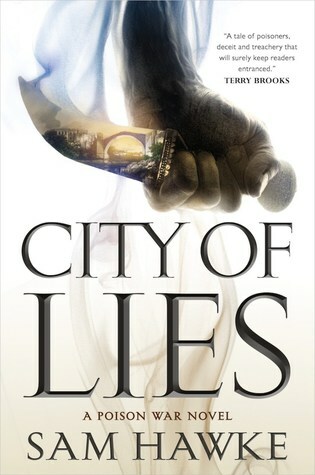 City of Lies is a fantastic book with a great premise, enthralling mystery, and compelling three dimensional characters. Even though it lags in places, the last third delivers and the positives far outweigh that one minor negative, making it one of my favorite books of 2018 so far. Where I got my reading copy: Finished review copy from the publisher.